Wonderful people, great facilities. Towels supplied, good food downstairs. Pool is awesome with water slide. Cheap rentals. So far this has been the nicest hostel I have stayed at in Costa Rica. It's very clean, modern, and spacious. The staff was super helpful and friendly. Definitely stay here if you want a groovy place to chill. Very friendly staff! Ideal location on the beach front. Availability to rent surf boards on site. Food and drinks sold on sight, hammocks on the roof, clean bathrooms and a kitchen to make your own food. Safe, secure and comfortable! Franco at reception is the man! Dodgy Jenny at the bar on a night is awesome and smiley too, she would definitely get it! Brilliant hostel and social pool daytime environment, only con is its far from bus station, location loses a point. Stay here, theres no better hostel in Jaco! Room2Board has a great vibe, has great facilities for the price, everything is kept really nice and clean, the location is great. You will get to meet lots of cool people by staying in their dorms. Room2board was absolutely awesome! Felt like I was at a resort. Planned to stay only 3 nights; made some friends and had to stay for a whole week. Food is prepared fresh to order, drinks are not overly priced, staff is friendly. Trying to think is something bad about it and I can't. Oh wait... Canadian hockey on TV would have been the icing on the cake ;) haha highly recommend!! Excellent place to enjoy the beach. Easy access by bus from San Jose. The terrace is a pleasant place to be at all times, breeze and fresh. The rooms and the toilets should have air flow in the area of five beds room. Great hostel with everything you would need! Atmosphere was brilliant, and you are a stones throw to the beach. A little further out of the main town, but that’s not necessarily a bad thing for some people! Really enjoyed our stay here. Room 2 Board is just a short walk up to the beach! It was very quiet on that side of the beach since it’s about a 15 minute walk from the city center area. We brought a car and there was enough parking! Great security at night, too. 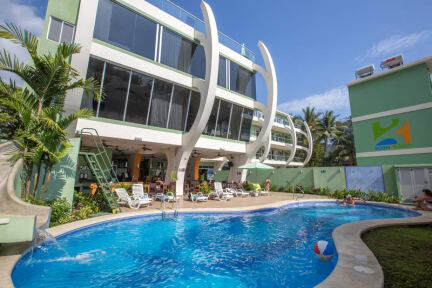 There is a nice roof top with hammocks to lounge in and a nice pool with awesome music playing. On Friday night, there was a DJ playing music by the pool. I recommend this place if you are looking for something a bit quieter.